The Indian Army (IA) first came up with its declassified official doctrine in 1998, and then again with a revised version in 2004. Subsequently, the IA came up with a sub-conventional warfare doctrine in 2006. The latest iteration of the IA doctrine has been christened the Land Warfare Doctrine (LWD)-2018, and is a follow up to the first-ever Joint Doctrine of the Indian Armed Forces (JDIAF) released in 2017. The doctrine for the first time discusses emerging technologies in the context of future warfare. It also aims to institute deterrence though punitive strikes at the tactical level, although this is more of a palliative cure. Despite some internal incoherence and ambiguous signalling on limited conventional warfare to the adversary, the value of the LWD lies in the clarity with which it identifies the threat spectrum. 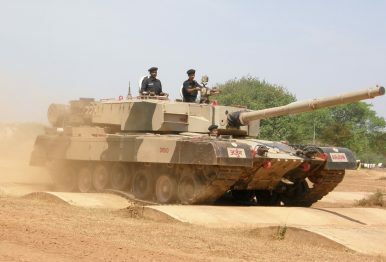 The LWD’s official acknowledgment of the combined threat from China and Pakistan strongly indicates that future force posture of the IA will be planned on the assumption of the worst-case scenario and marks a clear shift from single-front centric threat planning that has dominated military strategy in India towards a dual-front threat perception. LWD-2018 follows in the footsteps of the earlier iterations of IA doctrines following the nuclearization of the sub-continent in 1998. IA doctrine of 2004 (and the classified version in 2010) of enabling a proactive strategy in pursuit of fighting a limited conventional battle. Despite the acknowledgment that the space for conventional operations is being shrunk by the adversaries (pg. 3) in an implicit reference to Pakistan, the LWD claims that conventional operations will remain central in the conflict spectrum. In this context, LWD mentions that Integrated Battle Groups (IBGs) will give effect to the limited aims strategy. General Bipin Rawat, in a recent interview, claimed that IBGs will be structured on a case-to-case basis and the composition will vary according the to the terrain, etc. Interestingly, in a section (pg. 12) on the ‘Nuclear Environment’, the LWD maintains that the IA will continue to enhance the capability with a view to maintain the “tempo of operations” suggesting that conventional war-fighting by IBGs will continue even after the nuclear threshold is crossed. However once the nuclear threshold is breached whether these operations be still within the ambit of limited conventional objectives or evolve into full scale conventional operations is not clear in the doctrine. This might depend on the magnitude of the nuclear breach, but it is an important question to answer, because ramping up to full scale conventional operations might require a different scale of logistics. The declaratory value of the doctrine in signalling to the adversary is however ambiguous given limited conventional battle militates against the idea of war-fighting after the nuclear threshold is crossed. In the post-nuclearization phase of the sub-continent, India witnessed provocations ranging from Kargil 1999, Twin-Peaks in 2001-02, Mumbai in 2006 and then again in 2008, Gurdaspur in 2015, Udhampur in 2015, Nagrota in 2016, Pathankot in 2016 to Uri in 2016. Mumbai 2006 and 2008 failed to trigger any limited or for that matter a conventional ingress into Pakistan. At the operational level, the options that have been exercised have fallen short of the stated proactive strategy of fighting limited conventional battle. Since Mumbai 2008 these provocations have been limited to states of Jammu and Kashmir (J&K) and Punjab. These provocations have largely been responded to at the tactical/local level, with the latest being the publicly avowed “surgical strike” in response to Uri 2016. Therefore, in praxis, the military posture has been defensive at the conventional level while maintaining a defensive-offensive posture at the tactical/local level. Overall, this posture reflects a strategy of deterrence by denial and dissuasion. The LWD-2018, as was the case with the JDIAF-2017, seeks to maintain escalation dominance and systemize “surgical strikes” in pursuit of the proclaimed aim of achieving deterrence by punishment. To this effect, the LWD suggests an expansion of a special forces capability as a “vital component of overall deterrence” (pg. 11). The supply-side factors of terrorism, however, can’t be mitigated by operations along the Line of Control (LoC) and therefore it is very likely that such offensive and risky tactical operations might achieve a retributive effect without establishing any form of deterrence. The precise nature of these actions has not been specified in the doctrine. Doklam evinces that when diplomatic channels are exhausted and push comes to shove, physical actions in the domain of “minimal escalation” will be employed. However, the boundaries between what is minimal and what’s not so minimal may be very thin. The LWD does not specify how the escalation ladder might graduate from the actions that fall in the minimalist category. The LWD is the first official doctrine to recognize the possibility of a collusive threat from Pakistan and China and seeks to “prosecute military operations in a multi-front scenario in all dimensions” (pg. 1). This threat is also laid out in the section on ‘Future Security Challenges’ (pg. 2) where the doctrine mentions “collusive threat from adversaries” as one of the greatest external threats facing India. Indian statements in public have given a confused appraisal of this threat until now, although a clear trend of an increasing interoperability between the two militaries of Pakistan and China has existed for some time. Further, the LWD states that in the eventuality of a collusive threat “primary front will be dealt with all resources” while a “strong strategic defensive balance” will be maintained on the secondary front (pg. 5). Clear identification of this threat is bound to impact the force posture of IA and this might lead to a greater push towards reducing manpower costs and improving teeth to tail ratio in favor of a more agile force. Overall the push for theaterization might gain momentum as a corollary of the LWD. Warfare is undergoing a paradigm shift towards non-contact and stand-off capabilities, Autonomous Weapon Systems (AWS), electronic warfare, cyber capabilities that can have a decisive or degrading effect in the battlefield. For instance, cyber warfare can target logistics support systems and interfere with the fuel supply systems or sensors of combat aircraft, thus knocking them out of the equation without destroying them. LWD for the first time mentions some of the upcoming disruptive technologies going into the next decade and identifies the need to integrate Artificial Intelligence (AI) and robotics into war-fighting (pg. 9). LWD also expresses a quest for technologies like Nanotechnology, Quantum Computing, High Energy (HE) Lasers, Directed Energy weapons, Hypersonic weapons, Swarm attacks through Drones, Pulsed Microwave Weapon Systems, and Micro Satellites. This threat perception seems largely motivated by Chinese capabilities in this spectrum of warfare and sees merit in developing stand-off capabilities. Overall, the LWD as a doctrine adds value by clearly establishing the threat spectrum that India faces. This doctrine sets the basis for acquisition of newer capabilities catering to the changes in the nature of warfare. Consequently, the LWD for the first time introduces the quest for capabilities in AI and energy-directed weapons which offer standoff capabilities. The LWD is a step in the right direction. Even as it hopes for the best outcomes for operations conducted at tactical and limited conventional levels, it does very well to instigate preparations for the worst possible outcome of a collusive threat on two fronts. Joy Mitra is a fellow in the Asia-Pacific program at the EastWest Institute in New York and a visiting fellow in the South Asia program at the Stimson Center in Washington, D.C..